ONE 250ml Bottle of proven safe organic GLISTEN ShowSpray. OUTPERFORMS - OUTSHINES - OUTPROTECTS - WITH NO CHEMICALS! Ever arrived at that show n shine, cruise day, or other important event and noticed you'd driven through mud? Or worse, parked under a tree and recieved sap or bird droppings on your freshly detailed paint? YOU WANT to be able to remove debris and gritty spatter without scratching your paint, or otherwise damaging your detailing work. right? Then GLISTEN has the product you're looking for! ShowSpray is the perfect 'show day' partner. It's Scratch-Free formula is capable of removing most road related grime and contamination including gritty substances without scratching paint or removing the shine of freshly detailed paint. Will out-shine with virtually no effort required at all - seriously! One easy effortless step will clean, polish, shine, and protect your duco against fading, bird and bat droppings making your car a breeze to clean later! You don't even need to clean it first. No sweat! 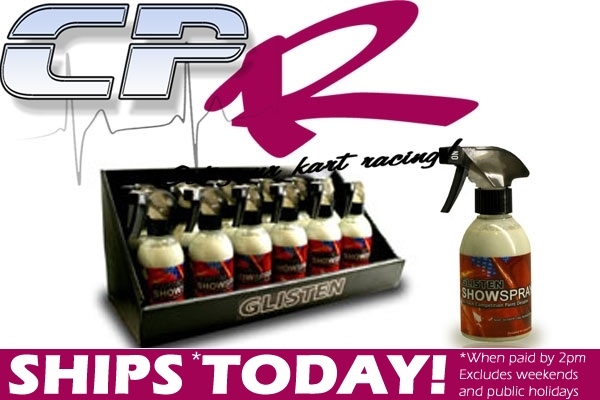 Because ShowSpray uses the same fundamental technology as the extremely popular 'Total Paint Care' product, it's safe for all paint types including 2-pack, acrylic, enamel, clears, chameleons, harlequins and pearls. Why? Because it won't remove any paint and it can't penetrate the paint surface. Zero preparation. Deep cleansing system. Non abrasive polish. Carnuba 'Hard as Concrete' protection. Out-shine on the day, the most convenient way - safe for all paint types including 2-pack, acrylic, enamel, clears, chameleons, and pearls. Show-stopping shine. quick no-fuss application anywhere anytime. BUY NOW AND RECEIVE 5.95 SHIPPING!